And I’m not even making that up… Notre Freaking Lame played Clemson tougher than Saban’s Alabama squad did in the national championship game. 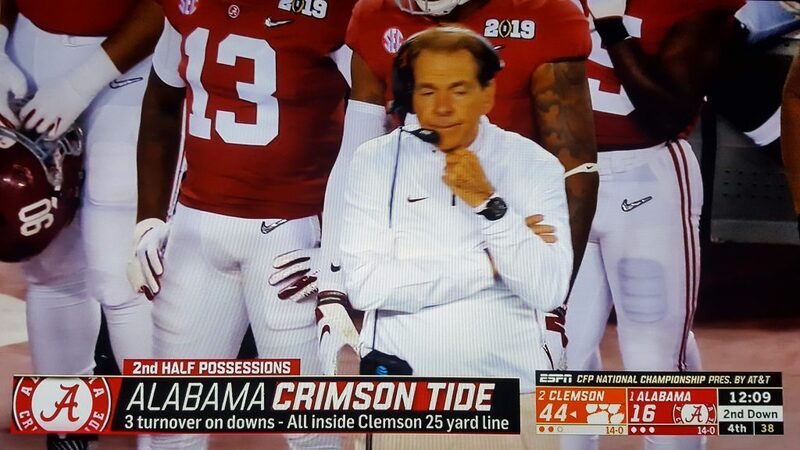 Tonight, Saban was the cause of Alabama’s biggest blowout defeat in over a decade! Saban took a 16-14 lead and then was outscored 30-0 to end the game. Time to fire this clown. Sign the petition now! Let’s break down the semi final action that we saw this year. Bama gets the #1 seed, that’s great. So they play the #4 seed. Where do the numbers 34 and 3 come from? They are the points allowed by Bama and Clemson respectively. The SEC is supposed to be a hard nosed defensive powerhouse conference and Nick Saban just gave up more than 11 times as many points to the #4 seed as Dabo gave up to the #3 seed. Something is wrong here and it is time for Nick to go! This is why we need to get rid of this clown and get somebody who can make smart football decisions to help restore the Tide to their proper place atop the food chain of college football. Nick Saban just lost to the team that lost to the team that lost to Troy. You know who didn’t lose to the team that lost to the team that lost to Troy??? Dabo Swinny and the Clemson Tigers, now there is a coach that is deserving of coaching our Tide. Fire Saban now! He can’t even hang with the likes of Troy. Thanks to Nick Saban, Alabama is winless at 0-1 in 2017. The following FBS teams all have better records in 2017 than Nick Saban. Nice coaching, Nick! Now GTFO. 40 FBS Teams Won Their Final Postseason Game… But Not Nick Saban! You know who didn’t win their final game of the season? NICK SABAN! Nick Saban Just Lost to a Team That Lost to Pitt! Nick Saban couldn’t beat a Clemson team that lost to Pitt earlier this season. That’s right: he just lost to a lowly one-loss ACC team.